Meeting 7:30 , Thursday Night! Please help! Very Important! 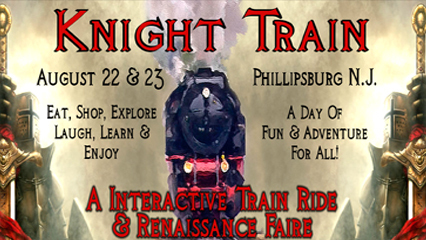 Received the following via email from The Delaware River Railroad Excursions, Phillipsburg, NJ. A week ago I sent out an email requesting help. The original email is below. Since then, Fox TV has visited us and done a great investigative report on the situation. 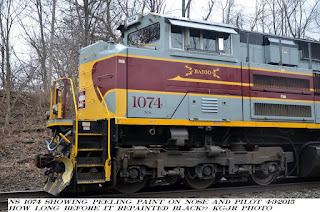 Please support the Delaware River Railroad Excursions / New York Susquehanna & Western Technical & Historical Society and make your opinion known. There will be a hearing before the County Agricultural Development Board this Thursday night at 7:30 PM. They will be discussing the matter, and will decide if the state will protect the Ol' Susquehanna Mine at the Snyder Farm under the states agricultural tourism laws. If they do the town will not be able to shut down the Ol' Susquehanna mine. Alternately you can write the Mayor of Pohatcong and tell him how you feel. The New York Susquehanna & Western Technical & Historical Society Inc. Seven years ago we built the Ol'Susquehanna mine on the Snyder Farm in Pohatcong, NJ. This attraction makes our weekly trips sustainable. As nothing on the mine site has a foundation, and is movable, we did not obtain permits as we believed we had the blessing of the town. They knew we were there, and never interfered because they knew what we were doing was good for the farm, the town and the county. About 6 months ago, we received a notice of zoning violation. At one point they even threatened me with arrest. It seems that two family's that live almost a 1/4 of a mile away, have a long standing feud with the Snyder Family. It is basically because of this they complained about the mine operation. After meeting with the Mayor and land use board the town told us they were very supportive of the railroad and the Snyder Farm. They promised to work with us to keep the mine site open. Every time they moved in a direction to put this issue to rest, they went back on their word. Finally it was agreed that we should have the mine considered as agricultural tourism. The state just passed several laws to protect farms and their ability to be self sustainable through agricultural tourism. This would work perfectly, as the Mayor promised a letter of support, after all, it was their idea. Rather than sending a letter of support, the Mayor sent a letter to the County Agricultural Development Board ( who presides over the right to farm decisions as well as agricultural tourism) stating that the Snyder Farm and the railroad should have nothing to do with each other. This is the third time the Mayor showed poor character and went against his word. On June 18th at 7:30 PM there will be a meeting of the County Agricultural Development Board. They will be deciding if the Ol' Susquehanna mine can be considered a legitimate method of attracting customers to the Snyder farm. If they decide that it is, we will fall under State protection and the town can not close down the mine. Our train passengers are responsible for the consumption of 10 acres of corn ( corn maze) and 4,000 pumpkins each year. Without the train, the Snyder farm would not be self sustainable. Because of a few vengeful people, and a very young and inexperienced mayor, our operation and the self sustainability of the Snyder Farm is at risk. PLEASE come to the meeting on the 18th and stand in support of the Snyder farm and the New York Susquehanna & Western Technical & Historical Society Inc. The mayor will be sending representatives to the meeting with the intent of slandering our operation and the Snyder farm. We need our friends and supporters to make it clear that they believe the Snyder farm has the right to make itself self sustainable by its unique relationship with our tourist railroad. Steam Returns! - Dad's ride Free! 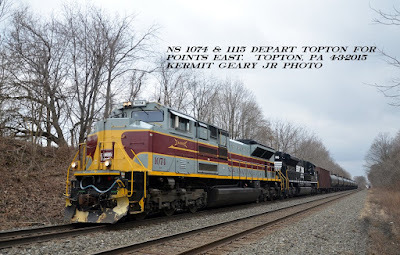 Received the following from The Delaware River Railroad Excursions, Phillipsburg, NJ. This weekend in celebration of Fathers Day, Dad rides free with any ticketed passenger*. One Dad per ticketed passenger, just buy your tickets and bring Dad along! Take Dad on the Winery Train! Does your Dad like wine? This weekend treat dad to the award winning Warren County Winery Train. Steam has returned once again to the Delaware River Railroad Excursions. Come ride behind this amazing machine. #142 will be operating every weekend through the end of october. NYSME will be hosting rail historian Victor Zolinsky as he comes to speak about rail operations in the NY area. Victor will be showing slides of the Erie, Lackawanna and the after merger Erie-Lackawanna from his personal collection. All photos were taken by Victor who started shooting photos in his youth, the 1940s, and continued his photography while actually working on the railroad. Victor would be hired on as a towerman on the New Haven and worked his way up to trainmaster, working at Grand Central Terminal. This is the second time that Victor has come to present. All will be astonished by the wealth of information that Victor is! All are welcome - Feel free to pass this on. Knowledge has no value unless shared with others. The bridge damaged by flood waters near Huntington, IN Tuesday June 16th has been repaired and opened to rail traffic. Due to the heavy backlog of traffic and the expectation of more heavy rains in the area over the next few days from the remnants of Tropical Storm Bill customers with traffic moving through this area should continue to expect delays of 48-72 hours. NS personnel remain on-site to monitor this situation and updates will be provided as necessary. The latest ETA and routing information is always available through Pacesetter and accessNS. Customers with questions regarding specific shipments should contact the National Customer Service Center. Customer Service Operations at 800-635-5768. Customer Service Automotive Operations at 888-649-9273. Customers with questions regarding local service should contact their Operations and Service Support Representative. Operations and Service Support at 800-898-4296. Heavy rains on the Lake Division of Norfolk Southern have resulted in a bridge collapse near Huntington, IN closing the mainline between Ft Wayne, IN and Peru, IN. NS personnel are on site and resources are being dedicated to repair the bridge and re-open the mainline as soon as possible. Customers with traffic moving through this area should expect 48 to 72 hour delays. John Grossmann, the Mountain Lakes Historic Preservation Committee Chairman has reached out to us to see if any of our members might be able to provide more information about this artifact. Please let us know if you can provide any guesses or insight. The assembly was recovered near the shore of Sunset Lake by the boat dock on the portion of the lake that's closest to The Boulevard, the main street in Mountain Lakes. It's along The Boulevard, on what's now a walking-biking path, that the Trolley tracks formerly ran. Note the flanges on the outside of the wheels. Might this be from one of the trolleys that ran from Denville to Boonton along the Boulevard? Possibly part of a boat/marine launching railway or plane? Please Let us know if you can provide any information. Photos of the wheel set may be see on our Facebook page: https://www.facebook.com/tristaterail.org/photos_stream. For those of you who are not members of Facebook, There is a 'window'/portal to our Facebook page on our website: http://www.tristaterail.org/ scroll to the bottom of the page then scroll down within the window. Received the following from Kermit Geary, Jr. Text and photos are his. Received the following from our correspondent in NW Pennsylvania. 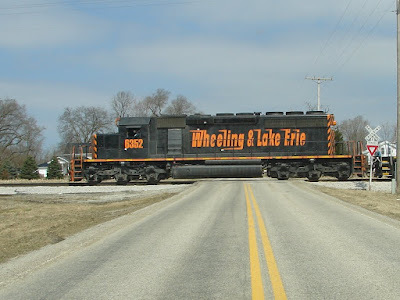 Photographer Ken Heyl shares with us Wheeling and Lake Erie Railway SD40-2 #6352, broadside, westbound over Chenango Road, approaching the former site of 'Hiles' Interlocking Tower (now CP 47 on CSX's old New York Central 'Big Four' Line) where, today, the Wheeling and CSX connect at New London, Ohio. April 1, 2015. Love that W&LE speed lettering! 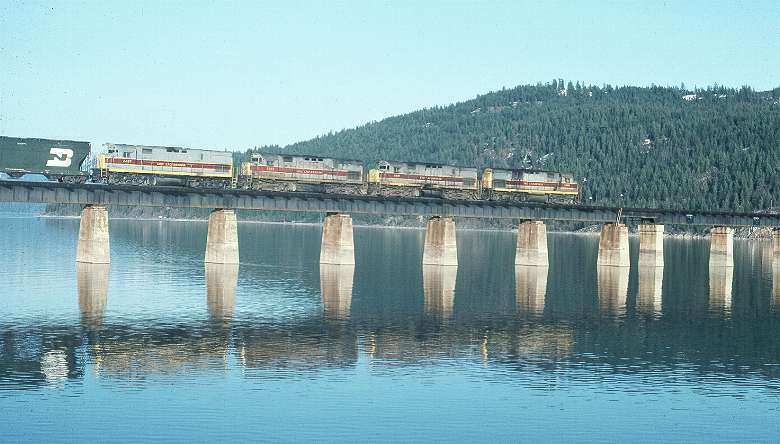 4 EL C425s power BN train at Sandpoint, ID 04-03-76 on way to BCOL! Received the following via email from our correspondent in NW Pennsylvania. 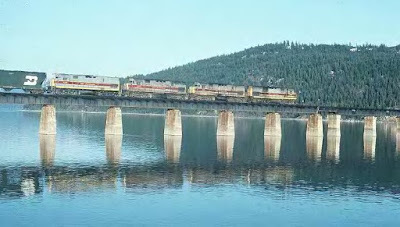 I knew the dozen Greyhound Leasing EL Alco C425s went to the British Columbia Railway instead of to Conrail, but I never saw this VER-Y cool picture of four of them as sole power on a westbound BN train across Lake Pend Oreille at Sandpoint, Idaho on April 3, 1976 on their way out to the BCOL! Received the following via email from Walthers. Please note: as of June 29th 2015 Weaver Models, being Quality Craft (610) and Scalecoat Paint (640) will be closed and out of business. They still have some paint colors available and we will stock what we can. Advise your customers to assess their needs and place orders ASAP. 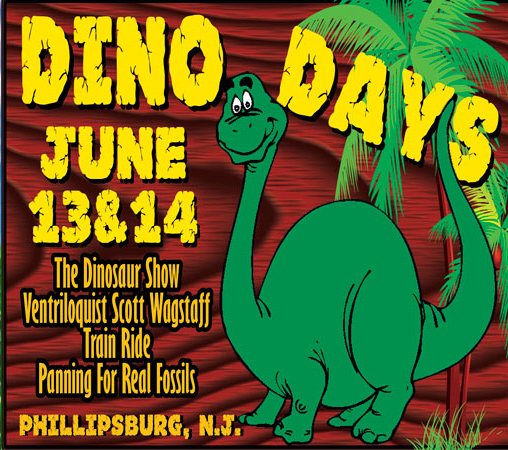 Temple Universities archaeologists will be at Dino Days THIS WEEKEND! For the Delaware River Railroad Excursions Dino Days, folks of all ages are invited to participate in a real archaeological dig! Activities will include interacting with professional archaeologists, digging and screening for artifacts, and getting dirty (but not too dirty)! Native American artifacts that date from 13,000 years ago to the 17th century from the Snyder Farm will be available for viewing. Come meet the archaeolgists from Temple University THIS WEEKEND! When the region's earliest inhabitants migrated into the New World during the Ice Age, Native Americans frequently revisited the Snyder Farm from 13,000 years ago up to the 17th century. Native people used the surplus of natural resources available at the Snyder Farm to help them survive. Many of these resources, such as toolstone (e.g., flint and jasper) quarries and natural springs, are still present today. An archaeological dig by students at Temple University studies early Native inhabitants and the geologic development of the soils and sediments found along the Delaware River. This will help us to understand Native lifeways and how people in the past adaptedto environmental change through the last 13,000 years. A full day of family fun! The Dinosaur Show - Field Paleontologists Mike and Roberta Straka. We will take you on a scientific exploration highlighting the world of dinosaurs, fossils and rocks/minerals. Journey to the Ol'Susquehanna mine and learn how to pan for real gem stones. Also on site our great Dinosaur themed food court and a Dino Days Gift Shop! Tickets now on sale for "A Knight Train"
Tickets are available for Readin' Railroad Story Time! This unique train tailored for our youngest guests features a reading of a popular children's book, a sing-along, magic tricks, and much more! The train departs Flemington Station this Saturday at 10:00 AM. Reservations are required, and are available through our website. Saturday June 13, 2015 to Saturday August 15, 2015 Enjoy a round-trip excursion between Flemington and Ringoes, and a reading of a popular children's book. Kids can follow along with their own copy of the book! Reservations required. "A" tickets are Adult tickets (age 12+). "C" tickets are Child tickets (under age 12). Make sure you consider how many books you want when choosing which tickets to purchase. Only tickets that indicate "1 book" in their description include a book! THIS TRAIN DEPARTS FROM FLEMINGTON STATION - RESERVATIONS REQUIRED. It's only June, but BR&W has already had a busy year! We've been working on the Alexauken Division, introduced a new coach on our passenger trains, and celebrated our 50th anniversary - but we're just getting started. Read up on our coming events, and get your tickets today! Departs RINGOES at 5:00 PM for a round-trip to Flemington, scheduled return to Ringoes at 6:15 PM. Reservations required, $15 per passenger. Departs FLEMINGTON at 10:00 AM for a round-trip to Ringoes, scheduled return to Flemington at 11:15 AM. Reservations required. Our Summer Excursions are now operating every Saturday and Sunday! This May we introduced former Central Railroad of New Jersey coach #1009 to our passenger trains. This coach was built in the early 1920's and our volunteers just completed an extensive overhaul, restoring its interior to its original appearance. Come ride any of our Summer Excursions to ride 1009! We've been pressing on with our effort to clear the Alexauken Division and prepare for track rehabilitation. Work crews have reached as far south as Mt. Airy, and we recently purchased more ties! Visit our website to see a brief video with some shots of our recent progress. On May 16-17 we celebrated our 50'th Anniversary in style - with a special train for railroad employees and invited guests, and special excursions for the public at our original 1965 prices. Hundreds of guests visited and enjoyed a ride behind steam locomotive #60. Former Lehigh Valley Railroad #112 is a small diesel-electric locomotive the BRRHT leases from Pennsy Railcar Restorations to pull many of our passenger trains when steam locomotive #60 is not operating. 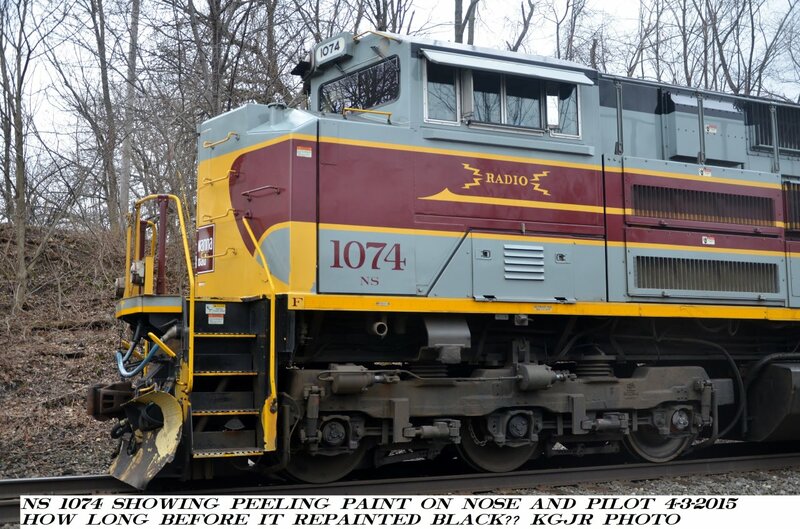 Recently, #112 received a fresh coat of paint honoring one of BR&W's first locomotives, #400. Come ride our Summer Excursions this summer to get a look! Saturday June 6, 2015 to Saturday August 22, 2015 Enjoy an evening train ride from Ringoes to Flemington and return in one of our historic cabooses! Cabooses from several railroads are available and include bay window, cupola, and wide-vision models. THIS TRAIN BOARDS AT RINGOES STATION - RESERVATIONS REQUIRED. 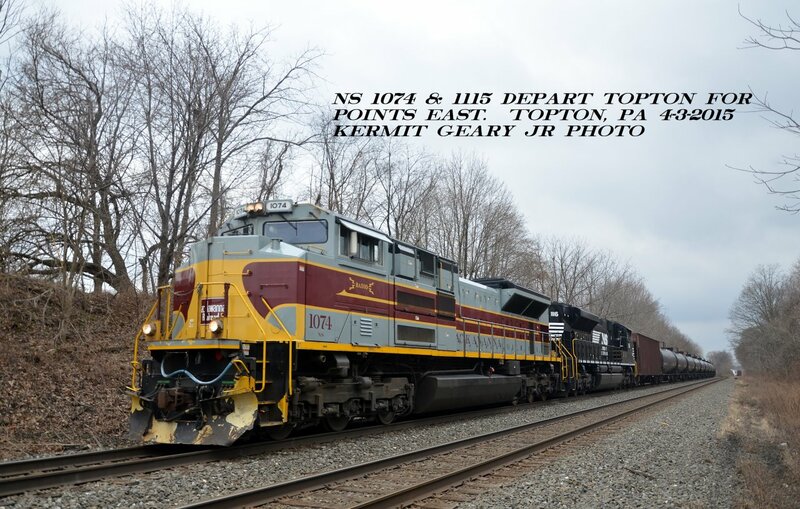 The Railroad Museum of Pennsylvania is having a special event this coming weekend (6-13/14-15) titled Norfolk Southern Days. The locomotive NS 911 described in the post below will be on display along with other NS equipment. 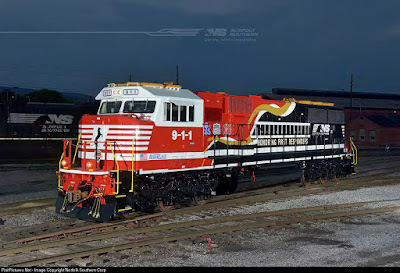 WASHINGTON, D.C., June 4, 2015 – Norfolk Southern (NYSE: NSC) in a ceremony at Washington, D.C.’s Union Station unveiled its latest commemorative locomotive, a vibrant SD60E honoring emergency first responders. The locomotive – with insignia recognizing police, fire, and emergency services – will enter general revenue service on Norfolk Southern’s 22-state network. 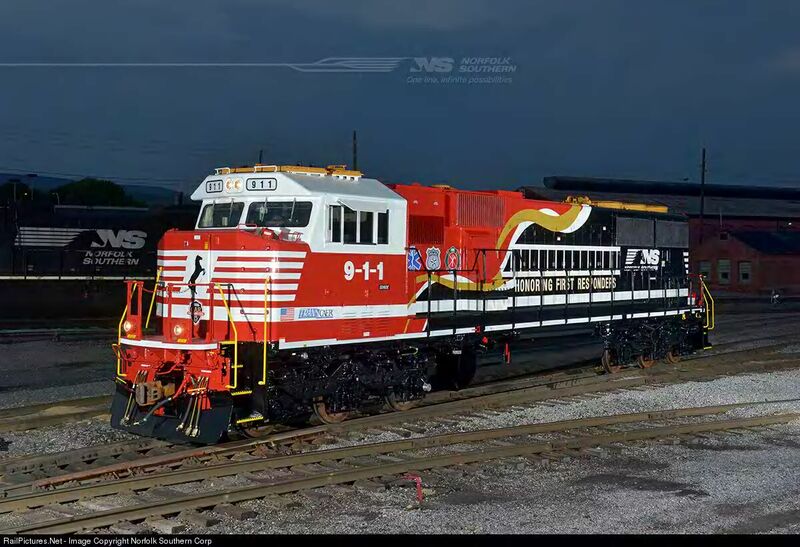 The red, white, and gold locomotive – its paint scheme designed by NS’ Visual Communications team and painted at the company’s Juniata Locomotive Shop in Altoona, Pa. – features the Maltese Cross of fire services, the Emergency Medical Services’ “Star of Life,” and the Police shield. It also features the logo for Transportation Community Awareness and Emergency Response (TRANSCAER), a national outreach organization dedicated to providing education and resources to help raise the level of emergency preparedness for the unlikely event of a rail incident. The locomotive sports “9-1-1,” the phone number to request emergency assistance, as well as the Norfolk Southern OAR shield. 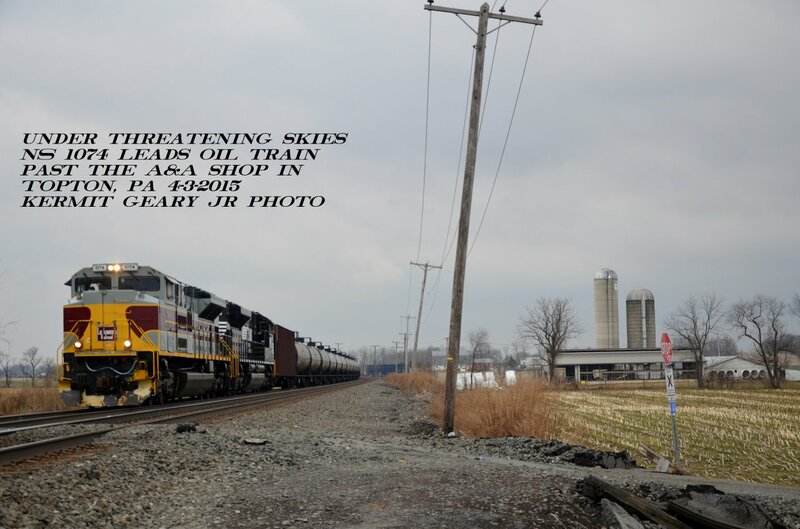 OAR – Operation Awareness & Response – is an NS program to educate the public about the economic importance of the safe movement of hazardous materials by rail to connect emergency first responders in Norfolk Southern communities with information and training resources. Norfolk Southern is a nationally recognized leader in providing training and educational resources to first responders. NS earned TRANSCAER’s 2014 National Achievement Award, the 15th time TRANSCAER has recognized Norfolk Southern for its efforts to help communities prepare for and respond to hazmat transportation incidents. 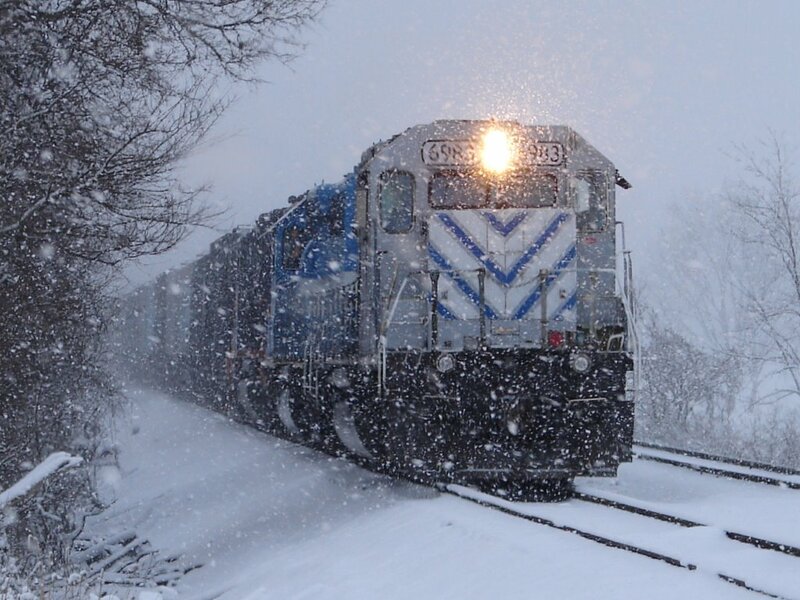 Norfolk Southern conducted or participated in 98 TRANSCAER community outreach events in 17 states during 2014. These included classroom and hands-on training, tabletop simulations, and full-scale exercises, which provided training for 5,442 emergency first responders. NS assisted in the development of the AskRail app that allows first responders to use their mobile phones to look up commodity and response information on shipments, and NS continued its commitment to providing high-level training at the Security and Emergency Response Training Center in Pueblo, Co. 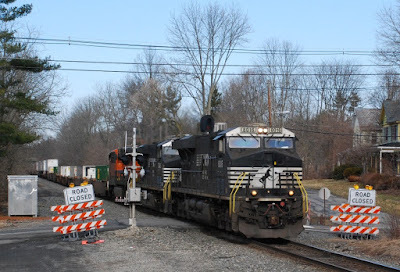 Despite what the "ROAD CLOSED" signs might indicate, the LEHL in Three Bridges (NJ; MP 48) is not closed to westbound trains. Site preparation was taking place for April 6th's grade crossing closure date for vehicular traffic. The closing should last about one week for the NS upgrade of this crossing. Seen here is NS 212 heading east at 9:31 on Wednesday. Motive power consisted of NS 8016, NS 7642 and BNSF 6529. 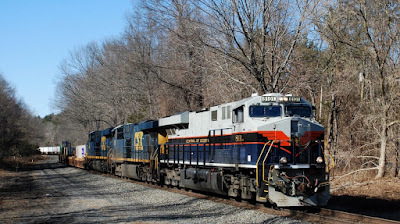 The "S" curves at Stanton Station, NJ (LEHL MP 53) is the location for this image of 20K (Chicago, IL to Croxton, NJ intermodal) around 3:58 on Sunday as it continues east towards Croxton, NJ. Looking at this scene finds quite a variety of railroads represented. The NS leader 8101 (ES44AC) represents the Central of Georgia RR with CSX 5267 (ES44DC) and CSX 754 (ES44AC) trailing. The tracks were once part of the Lehigh Valley RR, later Conrail and now NS. As for Stanton, it was at one time a station on the East and Amboy Railroad. Old Man Winter can be a tenacious sun-of-a-gun in March in northern Ohio and western Pennsylvania. Yesterday morning was a fairly nice here in Ashland, however when I got up to “CSX/WLE Land” the weather all CHANGED ! Here’s a photo from the “Winter Time RR Adventure” observed yesterday --- W&LE #6983 waits in a snow storm for a crew change at Chenango Road just east of New London, Ohio.